If you'd like to know about upcoming events at the space, please feel free to join the MAC Announce list at Google Groups here. MAC is open to the public on Saturdays, 11am�5pm [AS OF AUGUST 2012 MAC IS OPEN TO THE PUBLIC FROM MIDDAY TO 5PM]. Come check out the library, the bookshop, or watch a radical DVD. We've also got copies of our publication Black Light as well as many other anarchist and radical zines available. If you're interested in getting involved in MAC, Sundays is a good day to drop in to talk to other members of the club about using the space or getting involved. MAC is located at 62 St Georges Rd, Northcote. Melbourne Black #1 out now. Some members of MAC are involved in a regular anarchist publication, which is out now. You can also download a version to read on-screen. This statement has been prepared by the 'Melbourne Anarchist Club' (MAC), the owners of the 'Melbourne Anarchist Resource Centre' (62 St Georges Road, Northcote), in response to recent threatening behaviour by local neo-Nazis. It is intended to explain what has happened, and our response to it. On the afternoon of Monday, September 28, 2009, four neo-Nazi skinheads, believed to belong to or to be closely associated with the neo-Nazi skinhead groups 'Blood & Honour Australia' and the 'Southern Cross Hammerskins', attended the MARC. The neo-Nazis interrupted a meeting of a group which happened to be meeting at the time (a group which campaigns against sexual violence). The neo-Nazis were highly agitated and very aggressive, confronting those present and preventing their exit by blocking the front door. They screamed and shouted, pushed over book shelves, crowded individuals, and threatened physical violence (including the use of capsicum spray or 'mace'). The neo-Nazis demanded to know if the individuals present were 'antifa' (anti-fascists), and to be provided with the name and location of the blogger 'slackbastard'. After approximately 10 minutes, they left MARC with a final 'Sieg Heil!'. At 3pm Monday the 28th of September, several of us were sitting in the Barricade bookshop when four men entered through the front door. One of them, who was carrying a can of mace [pepper spray], yelled for us to sit down and that they had a message to deliver (he also asked who was in charge!). They proceeded to deliver a message that amounted to threatening that the MARC space would be the first point of call if there was any more antifa [anti-fascist] activity in Melbourne. They pushed over two bookshelves and swept some zines off the table as they left� Nobody was hurt, and there was no damage done to the space, just some disorganised books. We were all a bit shaken, but looked after each other. It is understood that the most vocal neo-Nazi was a man named Justin. Justin is in his mid- to late-30s, and has tattoos on his hands and neck. He is the Victorian organiser for 'Blood & Honour', and is also closely associated with the Hammerskins. It is also understood that Justin works at 'Hold Fast Body Art' tattoo studio in Burwood (13 Burwood Highway). During the course of their intervention at MARC, Justin informed those present that his business had been graffitied, and demanded that 'antifa' cease all such activity, or that there would be violent repercussions for MARC and its users. It is understood that this was a reference to an alleged incident which took place on Monday, September 14, an account of which, 'Anti-Fascists attack neo-Nazi's business in Burwood', was published anonymously on the Melbourne Indymedia website. There is no independent confirmation of this incident, but given Justin's subsequent behaviour, we understand it to be true. In summary: on September 14, unknown parties graffitied a tattoo shop in Burwood with 'anti-fascist' slogans. Two weeks later, on September 28, four neo-Nazi skinheads, including an employee at the tattoo shop in question, attended the MARC in Northcote and assaulted a meeting of a group campaigning against sexual violence, threatening further violence upon the group, MARC, and its users, unless all 'anti-fascist' activity in Melbourne ceased immediately. The Melbourne Anarchist Club remains committed to continuing to facilitate anarchist activity in Melbourne. and as a continuing resource for those, like the Melbourne Anarchist Club, who want to advance the cause of revolutionary, class-struggle anarchism. In addition to reviewing, along with the various groups which make use of MARC, our security and safety procedures, the MAC is organising an Open Day for the general public. The Open Day will take place on Saturday, November 28, and will include free food, entertainment, and a variety of other activities. More details will be provided in coming weeks. The Anarcho-Syndicalist Federation (ASF) has announced that it will be opening its new office at the Centre on Saturday, November 1. Barricade opened its doors on Saturday September 13, 2008. Check the Barricade website for details of opening times. NB. Barricade closed its doors in October 2009. It has re-located to Loophole community centre, 670 High Street, Northcote. They are looking for donations. See their post here. "What's the Melbourne Anarchist Club?" In brief: the MAC is a local anarchist organising project, first established in the late 1980s, that has recently completed the lengthy process of obtaining a property in Melbourne which, among other things, will be used to house Barricade infoshop. This process has been completed, and the new space -- formally titled the Melbourne Anarchist Resource Centre (MARC) -- is located at 62 St Georges Road, Northcote. 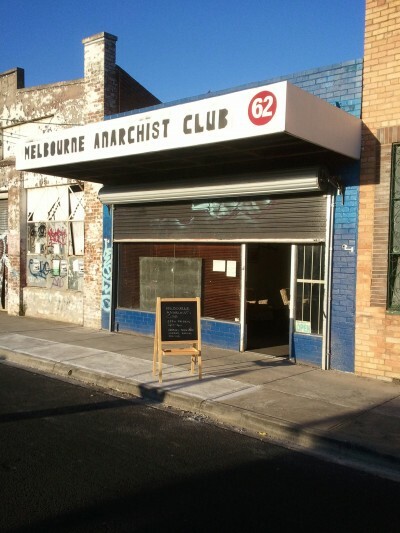 Membership of the Club is open to local Melbourne anarchists. NB. As of October 2009, Barricade infoshop is no longer located at the MARC. It is now located at Loophole community centre, 670 High Street, Northcote.